We awoke on the morning of the third day at 0300hrs. We had gone to sleep sufficiently early that this did not seem an unreasonable hour to surface plus the sunshine deceived our bodies into believing it was later. Our breakfast was more drawn out that necessary as we waited for rain to ease up on the lower glacier. This proved to be a smart move: we packed up and headed out, down Heartbreak Hill and then right, up the Kahiltna,overtaking groups that had set off earlier and gotten soaked by the rain. At one point the weather had closed in so much it was like walking inside a ping pong ball- all grey-blue, unable to distinguish sky from earth, just able to see the person in front, no distinguishing features around you. After five hours of cautious travel, breaking trail and probing for crevasses, and with Camp 1 appearing ahead of us, a narrow snow bridge gave way below me and I stumbled knee-deep into a crevasse, torso forward over the lip of the crevasse. I was at the back of the rope team. My ox-like team mate roped up in front of me kept charging forward, oblivious to my predicament, and pulled me straight out again! Just as well, as on the return I discovered that the crevasse was Camp One’s designated CMC bag disposal crevasse! Building camp at Camp 1 is easy in good weather. We arrived and it was 18-19c and snowing. 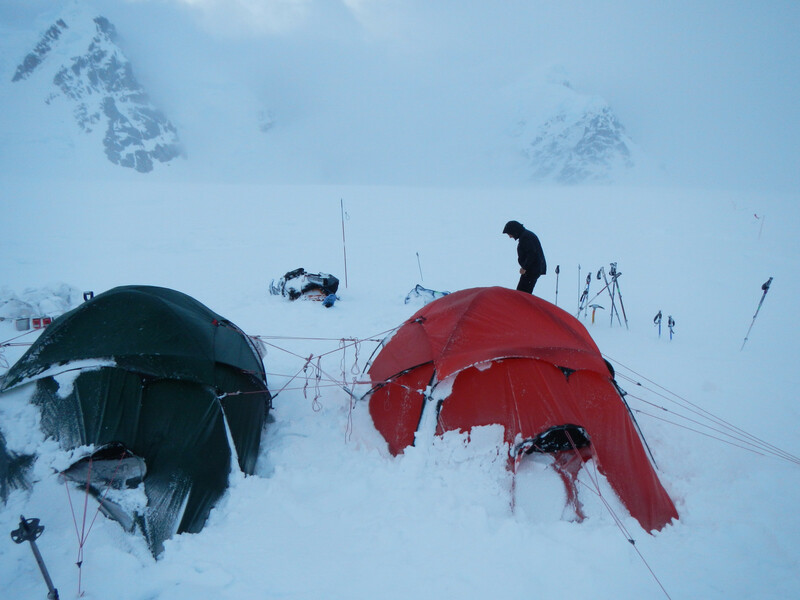 Shortly after our camp was erected, the wind came in and tested our tents. Out of snow we built a walled WC, with raised seating area, arm rests, protection from prevailing winds and a great view too! 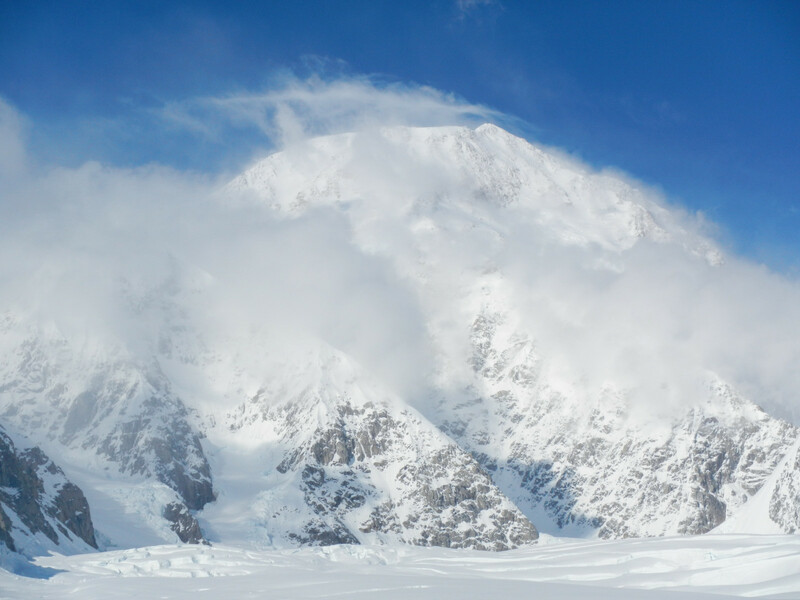 Our best views were of Ski Hill (our route ahead), panning over to views of Denali’s peak itself, and further on, the valley of death which avalanched regularly and on a colossal scale.